Welcome to Myrtle Beach Live! In its 75 years, the city of Myrtle Beach has grown into one of the world's most beloved beach destinations. Along the Grand Strand are 60 uninterrupted miles of shoreline that attracts 15 million visitors annually. That's certainly not everything. 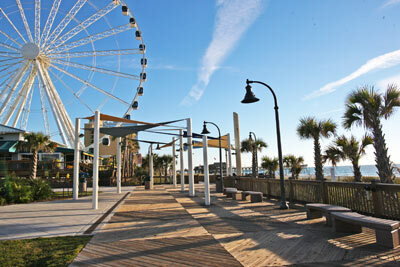 Guests can find a plethora of hotels, restaurants and entertainment options when they visit Myrtle Beach. Our beaches offer public access points and lots of convenient parking. Boredom is something one never experiences when they come to Myrtle Beach. Popular attractions and venues like Broadway at the Beach, The Market Common, the Alabama Theatre and Tanger Outlets provide everything from award-winning shows and delicious meals to hours of fantastic retail therapy. The majesty and wonder of the Atlantic Ocean can best be viewed at one of several city piers, like Second Avenue and Springmaid piers. These are perfect for taking a leisurely stroll hand-in-hand with that special someone, reeling in that perfect catch for the family to enjoy for dinner or enjoying a relaxing meal while catching glimpses of that clear, blue sea.